Following the earthquake that devastated Haiti in 2010 and left 250,000 dead, 300,000 injured and 1.5 million people homeless, Scott Champagne, a physical therapist with First Choice Physical Therapy, responded to the need for medical personnel to assist with crush injuries, fractures and amputations by volunteering his services. Champagne returned to Haiti again in 2011 and 2012 and was joined by Wade Rinehart, PT, DPT, the founder of First Choice Therapy. 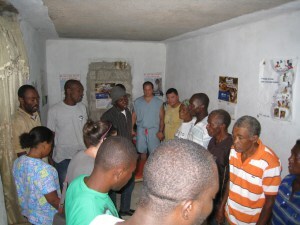 They started out in a tent with a dirt floor, in Jacmel, and have progressed to a clinic there. Rinehart and Champagne, who pay their own way for the mission trips, have been focusing on treating patients and providing clinical support and training for Jacmel’s only physical therapist and staff through an organization called Community Coalition for Haiti that raises money to help their citizens receive medical help. Champagne said that, although the Haitian earthquake was three years ago, their work is still vital. The trips have been an eye-opener for Rinehart. “I tried not to go,” he admitted. “But Scott said he really needed my services in starting a clinic. I prayed about it and went down there. That experience changed me. It taught me to appreciate all the blessings I have. Even if you live in your car in the U.S., you’re still better off than living in Haiti. Their day to day (activity) is finding their next meal. 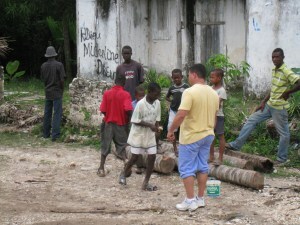 This year’s trip to Jacmel is slated for Oct. 19 to 26. “God’s working in a real way down there,” said Rinehart.